An artist's interpretation of the mid-air retrieval of the Genesis sample return capsule. Helicopter crews are poised to catch the falling spacecraft and its solar wind samples on Sept. 8 in Utah. An experienced team of pilots, engineers and scientists are relying on a reinforced skydiving parachute and a helicopter's hook to safely return the first samples from space since the Apollo era. But unlike mid-air retrievals of the past, the approach should be safer for both the helicopter pilots and their target, NASA's Genesis sample return capsule full of pieces of the Sun. On Sept. 8, stunt pilots in two helicopters are expected to pluck Genesis' descending sample capsule out of the sky above the Utah desert. The mid-air retrieval will mark the end of the NASA's mission to collect and safely return the first samples of solar wind blown out by the Sun. "We really haven't done extraterrestrial sample return since Apollo, and we've never done it with a helicopter before," said Don Sweetnam, project manager for the Genesis mission at NASA headquarters. To ensure mission success, a team of spacecraft designers and mid-air retrieval specialists has conspired to deliver Genesis' priceless cargo to safety. "The joke is, there has never been a more highly planned helicopter flight in history," said Roy Haggard, chief of mid-air retrieval flight operations for the mission, in a telephone interview. 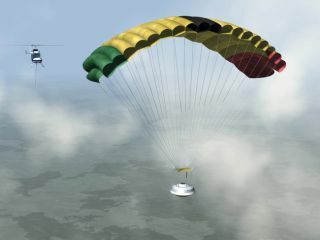 One of Genesis' major advantages over past sample return missions is its parafoil -- a parachute-like airfoil similar to those used by skydivers to safely breach the gap from plane to Earth. "It's more efficient," said Haggard, who is also CEO of the Elsinore, California-based Vertigo, Inc. firm that pioneered the parafoil mid-air retrieval approach behind Genesis. "It flies forward, so a helicopter can literally fly in formation with the capsule." The nylon parafoil measures about 34 feet (10.5 meters) by 12 feet (3 meters) and is reinforced with a load-bearing cable of Technora, a Kevlar variant strong enough to hold more than 10 sample return capsules, let alone one. Mid-air retrievals of satellite film canisters in the 1960s used round parachutes that fell straight down, creating low-pressure air turbulence just above the parachute. That could be dangerous to approaching aircraft, which could fall into the parachute canopy if the retrieval went awry. "It was essentially a near miss to a mid-air collision, and because of the turbulence [the parachute] dances around a bit," said Bob Corwin, Genesis recovery systems engineer at Lockheed Martin, which built the spacecraft. "All of that made the encounter a very tricky process." The Genesis encounter, however, is anticipated to be rather smooth, with the retrieval helicopter trailing the spacecraft by about 500 feet (152 meters) before zooming in for the catch. Haggard's stunt pilots have run through 11 perfect practice retrievals using a hook-tipped pole attached to each helicopter's struts. The hook detaches once it snags a parachute and 452-pound capsule (205-kilogram), and reels out about 400 feet (121 meters) to lessen the mid-air impact. "It's connected to a winch like a large fishing pole," said Corwin, adding that the line connected to the hook is made of the same Technora material reinforcing the return capsule's parafoil. Before pilots catch the Genesis capsule, they have to find it first. "Hopefully we won't be looking for it," Haggard said. Not only is the Genesis capsule equipped with a global positioning system beacon, but multiple radar stations at its retrieval site - the U.S. Air Force's Utah Test and Training Range -- should detect the spacecraft, allowing ground-based cameras to track the spacecraft. All of the tracking data will be fed to retrieval pilots. Haggard will be aboard the lead helicopter, which is set to grab the Genesis capsule about 4,000 feet (1,219 meters) above the Utah desert sometime around midday Sept. 8 EDT. The capsule will take about 10 minutes to reach the desert floor, offering the two retrieval helicopters ample time to make repeated attempts to catch the spacecraft. "I'm looking at this like another training mission," said Haggard, adding that the waiting will be the hardest part. "We have 10 minutes of loitering time...that 10 minutes will be torture, it'll seem like a day." Once the Genesis capsule is caught, its retrieval helicopter will make a brief landing to remove the parafoil before delivering the final package to nearby Michael Army Air Field, where waiting researchers have built a clean room for the vehicle. While Genesis is NASA's first spacecraft in decades to return bearing samples from space, it is not alone. The agency's Stardust spacecraft has already captured pieces of Comet Wild 2 during a Jan. 2 flyby, and will return a sample capsule to Earth in January 2006. The Japanese Aerospace Exploration Agency's Hayabusa spacecraft launched in May 2003 is en route to the asteroid Itokawa on a sample return mission due back in 2007. NASA engineers are also discussing the potential of Mars sample return mission in the future. "We think sample return is going to the next big thing for NASA," Corwin said.